If you need to take scale measurements from a drawing or even a photograph, using the Diagonal Scale is an accurate and simple method. Using some basic geometry, scaled dimensions and proportions can be extracted, providing just one dimension is known. Serious draftsmen/women use tools such as proportional dividers but for the rest of us, this is a simple and accurate method requiring only very basic drawing instruments. There are many instances where you might want to use the Diagonal Scale to extract dimensions, proportions or scale measurements. 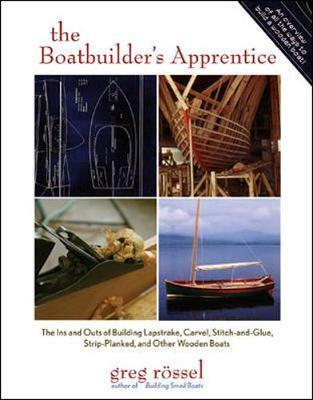 Perhaps you have a photo of a boat whose rig proportions you want to use on your boat. Perhaps you are restoring an old boat with a photograph as the only source of original dimensions. Or, as I did when I was altering the superstructure on Mignonne, I made several sketches until I had one with a profile which looked, on the sketch to be right, then used the Diagonal Scale to get the full size scale measurements. Clearly, the larger your drawing or photograph is, the more accurate your scaled measurements are going to be. The photo or drawing must be exactly beam on and as upright as possible. And you do need to know at least one dimension. So, take your photo or drawing and with your dividers or compasses measure off the dimension which you know. I’m going to use this crude little drawing, opposite, as a demonstration. And I’m assuming that I know the length on deck to be 22 feet 6 inches. On a separate piece of paper draw a line and with one point of the dividers on A mark off the distance A, B. The line A, B is exactly the same length as the length taken from the drawing or photograph. Now, not only do we want to scale that up but we also want a graduated scale from which to take other scale measurements. So, from point A draw a line A, C, at 45 degrees to A, B, this is the ‘Diagonal’. The line A, C, the ‘Diagonal’ now needs to be marked with whatever scale you want your final measurements to be in. Let’s assume that the length on deck of the boat in my demonstration drawing is 22foot 6inches. And assuming we want the final scale measurements in feet and inches. If we want to use the scale of 1inch to a foot, the point C, for our demonstration will be placed at 22.5 inches from A. Then, the line marked off with the scale of one inch to the foot. If you want the scale in meters and want to use a scale of 1 meter to an inch then convert the original dimension to meters. In this case 22.5feet equals 6.86M so length A, C will have to be 6.86 inches. However you can use any scale or unit of measurement you wish as long as it is based on that ‘known dimension’. Finally draw a line to bisect the points B, C.
Now you have the diagonal scale set up, you can use your dividers to take any measurement from the drawing/photograph. Any dimension can be taken with dividers, then marked along line A B from point A. For instance the measurement A, D.
With one point of the dividers on A then the point D is marked off. Then a line is drawn from D, parallel to B, C and where it dissects A, C, you can read off the actual distance from your scale. 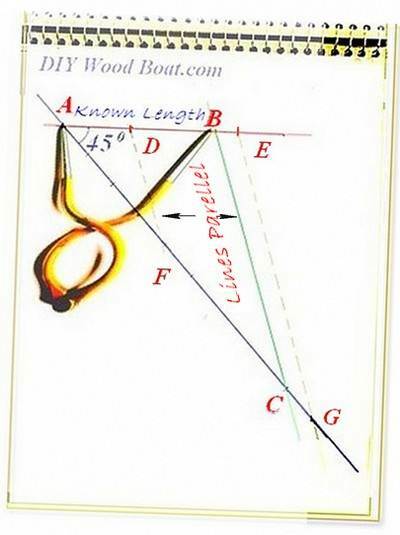 You can do the same for dimensions which are greater than the original such as the mast height in the demo drawing. Simply extend the lines A,B and A, C, and continue the same scale along A, C, as in the diagram. 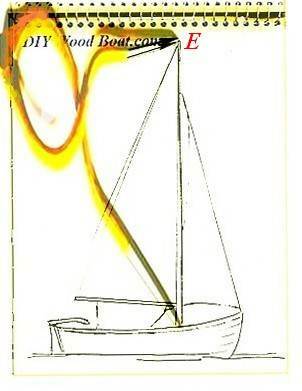 The method described above will give you the dimensions of the boat in the photo or drawing. 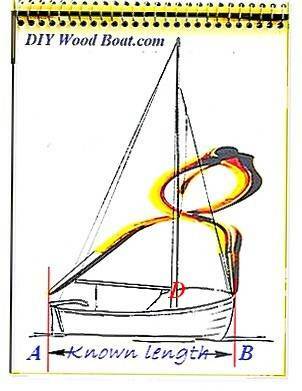 However the Diagonal Scale can also be used to transfer proportions from the photo/drawing to your own boat. Let’s say that you want to put a rig on your 20 foot boat but want to use the proportions of the boat in my diagram. In that case you can assume the measurement A, B, taken from the drawing, to represent 20 foot and draw the scale accordingly. You can scale up or down as appropriate. However, there is a limit to how far scale measurements, up or down will work as a practical boat. Even some minor alterations to size can have a drastic effect on the stability and performance of a hull.